WASHINGTON, D.C. -- Americans see each of four tobacco-based products -- cigarettes, chewing tobacco, cigars and pipes -- as being much more harmful to people who use them than marijuana and e-cigarettes, commonly known as vaping. The July 1-11 Gallup poll found that Americans view all six of the products tested as harmful to varying degrees. 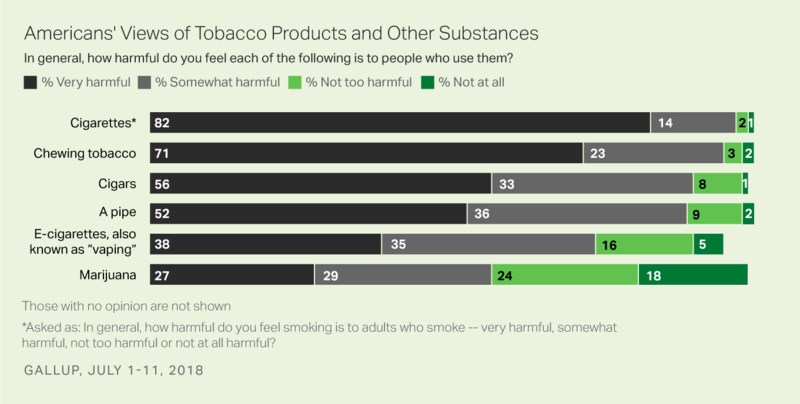 Majorities of Americans say cigarettes (82%), chewing tobacco (71%), cigars (56%) and pipes (52%) are all very harmful, while fewer say the same of vaping (38%) and marijuana (27%). Yet, when the somewhat harmful responses are factored in, all six products are considered harmful by majorities of Americans, with nearly all Americans viewing cigarettes (96%) and chewing tobacco (94%) this way. Seventy-three percent regard vaping as very or somewhat harmful, and 56% say the same about marijuana. Gallup research has found that Americans' use of cigarettes has fallen by half since the 1980s, when an average of 32% of adults said they had smoked a cigarette in the past week. Still, compared with the other products measured, cigarettes are used the most often by U.S. adults, with 13% reporting regular use and 7% occasional. The next most frequently used item on the list is marijuana, with 5% saying they use it regularly and 8% occasionally. The other products tested -- vaping, cigars, chewing tobacco and pipes -- are each used either occasionally or regularly by less than 10% of Americans. The percentage of U.S. adults who smoke cigarettes fell to 16% this year, the lowest rate since Gallup first asked this question in 1944.